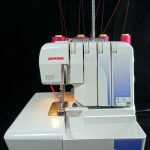 Since producing my Learn to Love Your Serger (Overlocker) online course, I have received a number of enquiries about them and this one from Nellie covered most questions so I thought I would share my reply with you all just in case some of you have wondered the same thing. Following is part of my reply to Nellie. When I first did my underpants pattern, lingerie elastic was not readily available in stores in Australia, so I did the pattern using plain 1/8 inch (3mm) braided elastic that can be easily purchased. Now when you go into the fabric store, Spotlight here in Australia or Joann’s in American you can find lovely lingerie elastic in a variety of colours, you know the pretty stuff with the little scallops along the edge. Things have been a little crazy at my house lately. Firstly, there was the arrival of my first grandchild…. yes, little Lachlan graced us with his presence in early February and is keeping his mum and dad on their toes! And then my darling daughter has packed up and will leave for New Zealand tomorrow where she and her boyfriend are having a ‘gap year’. Although everything will be exciting and new for them, I’m going to miss her terribly! So to help celebrate the ‘coming’ and take my mind off the ‘going’ of special people in my life, I’ve decided to continue the tradition of March Madness. This means you get a crazy 20% off everything storewide for the whole month of March! 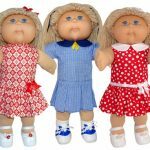 Wow, the 18 inch and American Girl version of my new Strappy Dress pattern has been proving super popular, so I’m thrilled to have it now available in the 18 ½ inch Cabbage Patch Kids size. 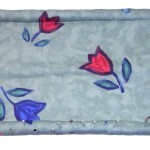 This pattern is super easy to sew and will certainly keep your dolls nice and cool in the hot summer months. It can be worn with or without a belt and you can change the look of the dress by simply moving the elastic from just under the breast, which gives it the ‘Baby Doll’ look, to around the waist for a more traditional look. I have also included options for making it with or without the trim along the bottom, using contrasting fabric for the strap and provided a bonus cutting line so you can make a top too! Welcome to my first Share and Tell blog for 2019. 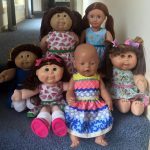 I have a very special story that I would like to start with because it brought so much joy to my heart hearing how my How to Make Doll Clothes course has helped multiple generations enjoy the craft of sewing. The following is part of an email that I received from Cherrylmaree, one of my very first customers and whom I now consider a dear friend. I’d like to share with you a couple of things that have been happening here. 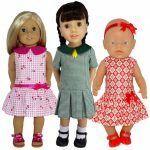 I just wanted to let you know that following your videos and tips has helped my granddaughter to learn how to use a sewing machine and translate that into making toys and pyjamas for herself. It has been a huge confidence boost for her. She’s not big on dolls but her sister is very keen and has recently bought herself an Australian Girl (so she can dress her).